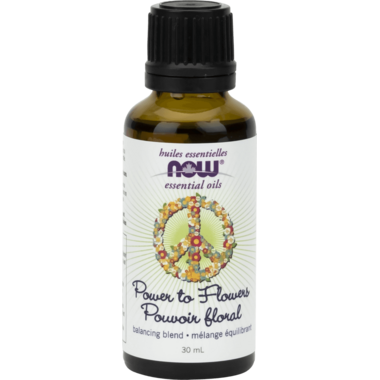 NOW Essential Oil Peace, Love & Flowers Blend is balancing, calming, soothing and uplifting. With a sweet, floral aroma this blend will help to wash all your worries away and relax your mind. Extraction Method: Patchouli and Ylang Ylang Oils - Steam Distilled; Orange Oil - Cold Pressed. Directions: Add to a diffuser or create your own room spray by adding up to 30 drops to 30 mL of water in a spray bottle. For fragrance purposes. For all other uses, carefully dilute with a carrier oil such as jojoba, grapeseed, olive, or almond oil prior to use. Please consult an essential oil book or other professional reference source for suggested dilution ratios. Caution: Keep out of reach of children. Avoid contact with eyes. If pregnant or lactating, consult your healthcare practitioner before using. Not for internal use. Reacts strongly to sunlight and other sources of ultraviolet light. Natural essential oils are highly concentrated and should be used with care. I love the scent which is also very soothing. I've used it in our diffuser at home and also in my car. Smells soooo good. I wear it in a necklace diffuser so I can smell it all day long. I bought this as a birthday gift for my sister- how wouldn't want peace love and flowers for their birthday?. It was also on sale, so that was nice. She was excited to try it. Very pleasant smelling.